World War I was ending when Lou Wolfson was born in Moscow, Pennsylvania, to two immigrant parents from outside Moscow, Russia. 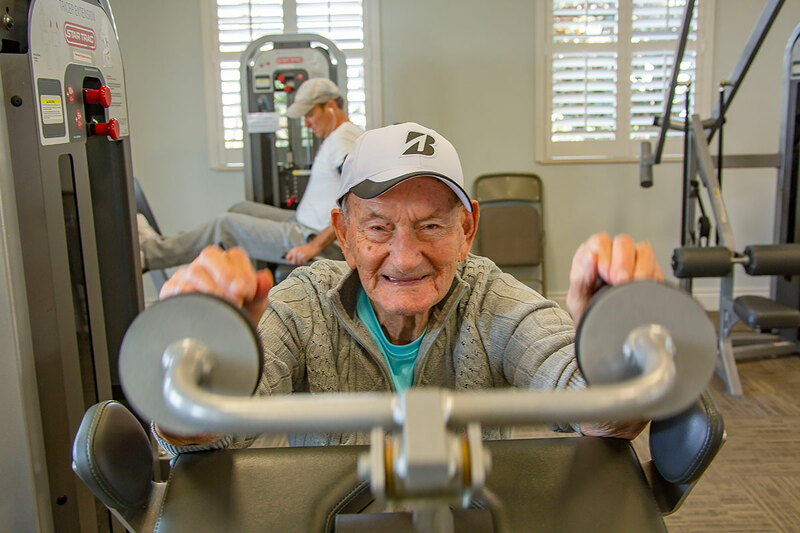 Still spry at 100, Lou works out three or four days a week at the Verano Clubhouse gym, where his son is a resident. The former chiropractor and physical education teacher is quick to credit those around him for his good health. “I am here because of the excellent care I get from my son, Marty, and the people at Watercrest and the excellent food they give me,” says Lou. Verano and Watercrest are less than two miles away from each other between Tradition and St. Lucie West. Known as “Doc” in Gary, Indiana, Lou taught physical education, including years with special education students, coached Little League and served as a scoutmaster while raising two sons. Hundreds of young children from Gary learned their lifelong swimming lessons from Lou during their summers away from school. With a twinkle in his eye, Lou tells the story of a boy born without legs who used to wear braces with shoes, so in a wheelchair it would look like he had legs. “When I taught him how to swim, I thought he was going to scratch my chest with his fingernails, he was holding me so tight,” says Lou, like it happened yesterday. The boy grew to be a man, beat a drug problem, became a certified public accountant and raised a family, Lou says proudly. Lou is the youngest and only surviving child of six children born to his father, Morris, who died at the age of 105. Morris was a merchant, junk dealer, shoemaker and gardener, Lou says. He worked many jobs to pay the bills for his six sons and daughters, who would all graduate from college. Married for 72 years, Lou’s wife, Helen, passed away at age 98 four years ago. “My wife always knew what I wanted or needed before I did,” he says. The picture of health at 100, Lou gets around on a walker with wheels, but he can walk short distances on his own. He gave up swimming two years ago. He played tennis into his 90s and was in a bowling league until he was 95. Thirty years ago the Wolfsons moved to Florida, and it was 20 years ago that Lou had a pacemaker implanted. His blood pressure would go so low at night, he would get up and run around the block to bring it back up. During World War II, Lou spent 39 months training as a ferry pilot to fly planes to England. A migraine condition forced him out of the service, with the Army angry at him for not telling them about his headaches. He is not currently on any medications. A typical day starts with Lou tackling the cryptogram, jumble and a crossword puzzle before breakfast. He likes to get some sun every day, and he watches sports or goes out with Marty. “All the players today have so much speed in football, baseball and even tennis,” says Lou, who stayed up until 3 a.m. for the end of the 2018 World Series game that went 17 innings. “Stay healthy and have a lot of birthdays,” advises Lou, who never smoked and has one glass of wine for happy hour every Friday.